Sir Isaac Brock was a very skilled commander. His name is on lot’s of things, including Brock University, Brockville, Ontario, Brock Street in Kitchener, and a Brock Road in Cambridge. He even has a statue at Queenston Heights, where he fell in battle. Commander Brock had a very small force of British troops against American armies that were way larger, in some cases being over ten times! Due to Brock’s large amount of experience and skill being a commander, he was able to think of tactics to outsmart and defeat these American armies. Let’s talk about an example. Tecumseh and Brock were great friends and allies. There was an American general holding the fort and town of Detroit. General William Hull was an inexperienced American general, and Brock and Tecumseh took advantage of this. They were able to intercept a letter from General Hull, and through it they learned that Hull had a fear of First Nations people. Tecumseh has his men run up and down by Hull’s men, tricking them into believing there were a lot more men than there really were. Through bluff and deceit, Brock and Tecumseh were able to get General Hull to surrender Detroit. 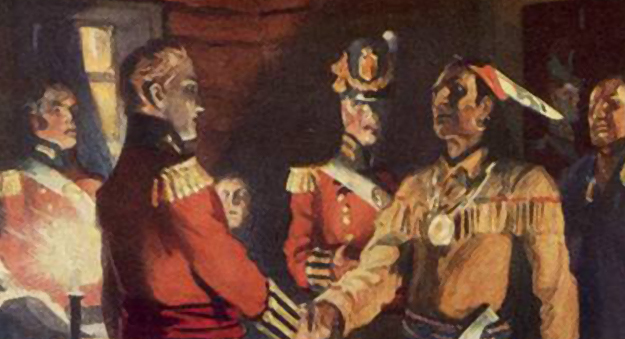 Brock was also able to accomplish incredible feats like turning Joseph Willcocks from foe to friend, and even capture Fort Mackinac. Unfortunately, Sir Brock’s demise was at Queenston Heights, near Niagra Falls. The Americans were invading again, and instead of waiting for reinforcements Brock along with a few of his men charged to try and claim their guns, and fight on. Brock was shot through the heart, and passed away. This was undoubtedly an act of bravery, but it is arguable that it would have helped Canada more if he’d retreated and waited for more men to arrive. Now, Isaac Brock is known by many as the hero of Canada. As I demonstrated above, he was able to defeat many American forces that were way larger than his. So after Brock passed away, how did it alter the outcome of battles that took place afterwards? 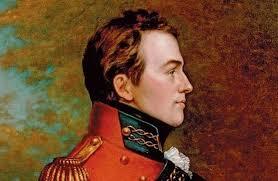 The reason Sir Isaac Brock’s death happened was because of his impulsive action to defend his nation. There was no way Brock’s men could hold against the oncoming forces of America. After being pushed off Queenston Heights, Brock along with a few other soldiers attempted to rush up the hill and recapture their guns. Here is where a bullet went through Brock’s heart, and he met his doom. Brock’s decision had a devastating consequence- his life. What caused Brock to risk his life and charge up the hill was his passion for Canada, and how he didn’t want to give up so easily. After Brock’s death, there were big battles such as the Battle for the Thames, the Battle of Crysler’s Farm, and the Battle of Lundy’s Lane. If Brock didn’t die, he probably would have led men in them, and just going by the insane amount of skill and experience Brock possessed I think it’s safe to assume he would’ve led a few of those battle. Perhaps he could’ve led the British to victory in the battle of Lake Erie, but Brock also could’ve died there as well. There are lots of reasons that these events turned out the way they did. In the battle of the Lake of Erie, the British got an early advantage and nearly destroyed the American flagship, but the American general had himself rowed to another one of his ships, and attacked the two largest British ships. In the end, the British surrendered and the Americans won the fight. We can’t be sure if the battle would’ve been won by the British if Brock was leading the British navy, but it’s safe to say that the outcome would be different. Brock didn’t surrender easily, and he could’ve used some smart tactics against the Americans to win. I wouldn’t doubt it. There were lots of different possible outcomes that could’ve happened, and lot’s of causes for the series of events to unfold in the first place- like the invasion that caused Brock’s death, Brock’s decision, the shot that went through Brock’s heart, etc. Just like this, there are lots of different circumstances that could’ve had different outcomes in the battles that took place. Our lives and conditions are similar to those found in my research because even today we fight wars with other countries if we must. Although we try to avoid wars, we still have to fight if it comes down to it. In these wars, there are times that we lose a valuable soldier who dies defending their country. This is similar to the War of 1812, because Isaac Brock was dubbed the ‘Hero of Canada’, and he was a very skilled commander. The loss of a great commander can result in a totally different battle outcome. A skilled commander versus a less-experienced commander can be the difference between a win and a loss. This is similar to war in the current day. Losing a skilled and capable leader can be the difference between a win and a loss. This is also quite different from our everyday life because we have established peace with America, and most other countries for that matter. Back when this dispute took place Canada was a developing nation, whereas currently we are independent. We’ve also established borders now, and we have security on them. Back when the war took place, there were no established borders and Canada was just a place where everyone that was running from America went. They gathered, and together they worked to defend the country from the Americans. Based off of my research, I can conclude that the death of Sir Isaac Brock had a significant impact on both the Americans and Canadians. For one side it’s a good thing, and for the other it’s a tragic event. The Americans were relieved to have gotten rid of such a dangerous and experienced enemy, whereas to the British it was a terrible loss, and a tragedy. The death of Sir Brock affected the British to a considerable amount, and it is debatable that Brock’s absence led to some of their losses. It is also arguable that Tecumseh may not have died if Brock was still alive, because they both could’ve been at a different battle at that time, or Brock was the commander with him rather than the one that fled. In this case, they may have won the fight, and Tecumseh wouldn’t have died. Or at least at the time. Everyone is bound to die someday. I am sure if Brock survived the Heights then he would’ve led battles that took place afterwards. One notable example is the Battle of the Great Lakes. Brock had predicted that the key to winning the war was naval control of the Great Lakes. Since Brock himself had known this, he definitely would’ve been fighting in this battle because it would play a huge impact on the outcome of the war. The absence of Brock was relatively big in this battle, and who knows the British might’ve even won with Brock’s guidance. Keep in mind that the American general in the Battle of the Great Lakes was also a highly skilled person, and they were willing to risk their life for military success. Sound familiar? It should, because that’s exactly what Sir Brock does. The battle would’ve been quite close, and it’s tough to say who would’ve won. Keep in mind I used the Battle of the Great Lakes as an example. There were also lots of other battles that took place, but some of them missed the absence of Brock more than others. 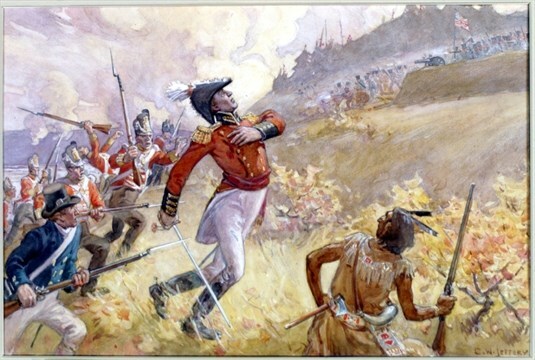 I feel like the death of Sir Brock impacted the battles that took place afterwards quite a bit, because he was one of the best commanders Canada had. The death of Brock did affect the battles afterwards a lot, because there were few people like him at the time, and without him the British lost their arguably best commander- which may have played a large role in winning the war. Great work considering multiple perspectives throughout this final independent investigation. I agree that the longterm consequences of Brock’s death were felt very differently by both the Americans and British at the time. During your research did you find any information on how Brock’s death was viewed at the time, as opposed to how it is viewed now? You might want to consider this when looking closely at continuity and change. I am very intrigued by this idea of Tecumseh surviving if Brock had not be killed — what evidence might you use to further strengthen this argument? Overall solid work! I did not find too much information on how Brock’s death was viewed in the different time periods, however based off my research I can infer that it was a lot more impactful back in the 1800’s than the current day. I believe this to be case because the 1800’s were when everybody knew who Brock was, and he was actually out there, leading troops against larger, American armies. Nowadays, although there are many locations named after him, not everybody knows him. He isn’t as popular as he was before, which is why I feel like his death was more impactful to those that lived in his time.